Double check your discord link, as it's expired! Otherwise, I might lurk when I return from moving-related hiatus. Several from <The Sixth Council> will be checking this out. Including me! Attention! The Second Shadow Syndicate's having their first IC Meeting tomorrow shortly North-East of the Cantina within Raider's Cove (Rishi) at 9PM EST. You'll be stopped at the door and questioned with a password: "Aratech" to be allow safe passage inside. Below's a map should anyone not know where I'm talking about: See you all there! 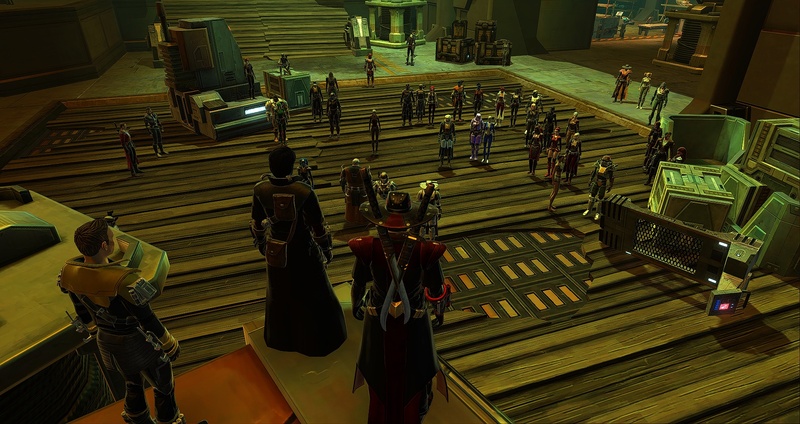 The first meeting held by the Second Syndicate and its imperial representatives had a great attendance! A rowdy crowd, shaky start, and uncertain outcome, but managed to nonetheless form a good basis for the organization and cause that the underworld has come together to chip in for. We're keeping a watchful eye over proceedings and making sure that the plot is progressed, and it is by no means too late to get involved! Simply contact us over enjin, ingame or the shadow syndicate discord to get in touch with us and get involved! 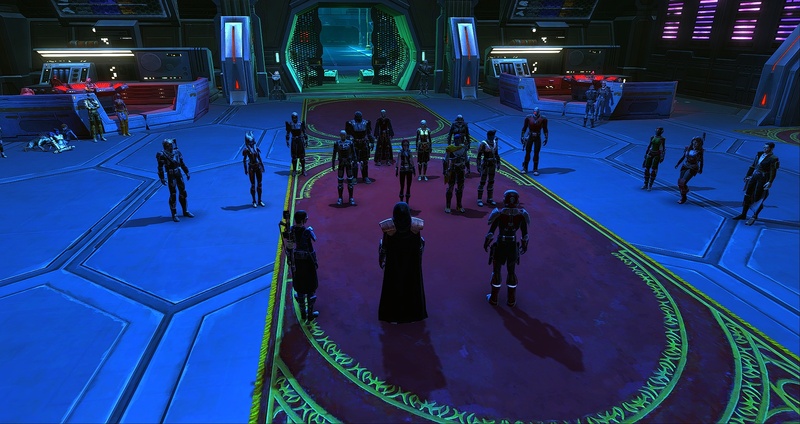 The first grand hit of the Second Syndicate could be felt across the slums and high spires of Nar Shaddaa after the recent losses sustained by the Nar Shaddaa Exchange. A vast collection of criminals, mercenaries, pirates and scoundrels assisted by imperial personnel and a few Sith took on the old enemy who were none too pleased to hear of the rise of a new imperial initiative to rally the underworld. The resistance was ill-concieved however, and the Exchange suffered many losses as they were struck from three sides simultaneously, one team designed to rig explosives and detonate the generator grid that powered much of the level the Exchange's main complex on Nar Shaddaa sat upon, another to act as a distraction for the main bulk of its' gangs, and the last to storm their headquarters in a successful attempt to take one of the leaders of the Exchange on the moon captive. With only moderate injuries to contend with after the strike, the Syndicate declared a decisive victory following the hit, and mounts for more action once the spoils have been shared.